Spanishpod101 has a proven and practical approach to teach Spanish. It starts with usual day-to-day conversations between friends and family so you as a student can relate and recognize the basic phrases used as soon as possible. The Beginner Level starts with “Survival Phrases”. Common sentences and situations that all Spanish student needs to learn at first hand. 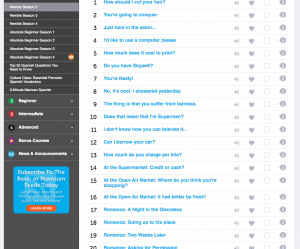 As you can see, topics are common phrases used on a daily basis on almost all Spanish conversations. Saying hello and good bye, asking for directions, ordering food and basic numbers, among many more. This approach to Spanish lets the student slowly immerse in the new language´s most common situations. As you progress and move into the following stages of Spanish Lessons at Spanishpod101 (Newbie seasons and Absolute Beginner Seasons 1 through 4), you will be able to start combining more words, verbs and express complex thoughts and ideas. One of the many advantages of this system is that if you feel one of your Spanish lessons is too much for you and you are still not ready to take in that much, you can stay on your actual level for as long as you like and practice with all the provided tools until you feel you are ready to continue. The new phrases and verbs introduced are carefully selected by the Spanish pod101 team to facilitate your transition between levels. For example, on the Spanishpod101 Newbie seasons you will start practicing longer conversations and more specific questions. Just as you can stay at one level of your Spanishpod101 Spanish lessons until you feel comfortable with all the phrases used, you can also “go forward”. You would think this is almost unnecessary, but I have found it to be very helpful. Let me give you an example. Let’s say you will be going to a party and you know there will be a new group of great Mexican guys that you want to befriend. 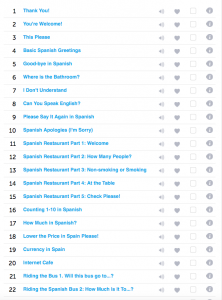 Well, you can practice what to say by browsing through the Spanish lessons and finding a similar conversation. You can practice all you want and have a great time while making lots of new friends! !